If you put a frame around them, you can clearly see that they’re making spectacles of themselves. Frame or not, these girls are spectac-ular! They will flat get you to where you want to go. I get so tired of promises for a Good Year that fall flat. Should Tirematch.com be retired? The big wheels at TireMatch.com stand behind their system. 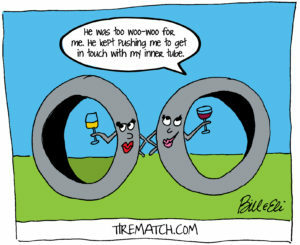 They say tires are matched with others that move in the same circles—at least at the start of the relationship, and they say the company cannot be held responsible if one of the parties decides to fool a-round down the road. I hate those over-inflated love egos! I love your language play (soon to be a ‘toon).